Back to the 80s – Thank you to everyone who helped with transport and supervision on Tuesday to MBAS to watch their latest musical production. 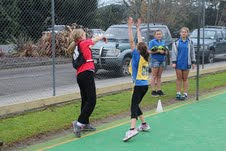 Winter Sports – The cold didn’t slow the children down with our years 7&8s coming 1st = with Whenuakite X with a total of 12 points. Congratulations! Our years 4,5&6s came 4th = with Whenuakite T with a total of 9 points. Thanks to Kerry for the extra training she has given our children in Netball and rippa rugby. Thanks to Sam Toworai who took these fantastic photos of the children at Winter Sports. End of term 2 – next Friday is the last day of term 2, and the school will re-open on Monday 29th July 2013. Sports roundup - Congratulations to 5th grade rugby players James Arthur who scored a try, and to Liam McQueen who scored two tries. Liam was also player of the day and voted best and fairest player by Paeroa 5th grade rugby team. Congratulations to Hannah Parry who was player of the day for year 7&8 netball. Congratulations to Zoe Jordan who scored a try and was player of the day for Coroglen Rippas against Mercury Bay. Stationery accounts – are attached to your newsletter.